While Amazon is including Destiny in the promotion, many other retailers are either excluding it, or not making it eligible until the 9th when it releases. The bundle is obviously counterprogramming against Destiny's alignment with the Playstation brand, and certainly not the only instance of it , but hey, if it gets us a free game we'll take it. 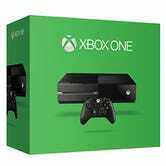 Like we mentioned earlier in the week, the promotion applies not just to the standard Xbox One, but also the Madden NFL 15 Bundle, and the Forza 5 Bundle (which includes Kinect). Interestingly, retailers like Amazon and Newegg are sold out of the Madden Bundle, and we've been told they won't be replenishing their stock. Microsoft is running a $50 gift card promotion alongside the free game promo, but we have yet to be able to see both the free game and the free gift card in our cart, and they have several bundles to choose from. Best Buy is (potentially) making the deal even better by offering a two-year Gamers Club unlocked membership with the purchase of a new PS4 or Xbox One. We'll have to confirm whether the two deals stack. Want to maximize value? Get Destiny or Diablo III. Basically every other game on the platform has already been regularly available for $40 or less. 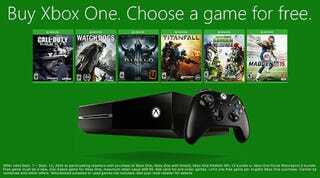 Is this the push you needed to buy an Xbox One, and if not, what kind of deal are you waiting for? Let us know in the comments.